نسب پور, سحر, حیدری علمدارلو, اسماعیل, خسروی, حسن, وصالی, علی. (1397). پهنه‌بندی آسیب‌پذیری از خشکسالی در ایران با استفاده از مدل AHP و منطق فازی. 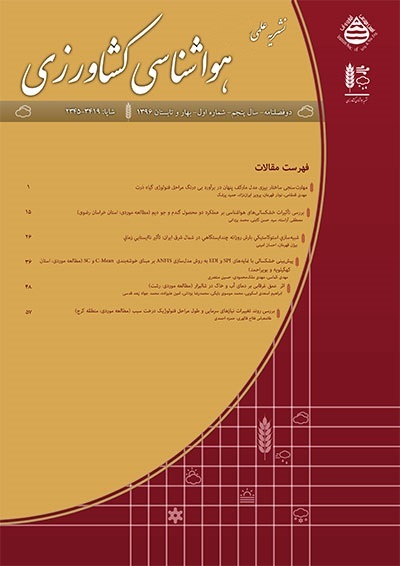 هواشناسی کشاورزی, 6(2), 3-12. doi: 10.22125/agmj.2019.113607. سحر نسب پور; اسماعیل حیدری علمدارلو; حسن خسروی; علی وصالی. "پهنه‌بندی آسیب‌پذیری از خشکسالی در ایران با استفاده از مدل AHP و منطق فازی". هواشناسی کشاورزی, 6, 2, 1397, 3-12. doi: 10.22125/agmj.2019.113607. نسب پور, سحر, حیدری علمدارلو, اسماعیل, خسروی, حسن, وصالی, علی. (1397). 'پهنه‌بندی آسیب‌پذیری از خشکسالی در ایران با استفاده از مدل AHP و منطق فازی', هواشناسی کشاورزی, 6(2), pp. 3-12. doi: 10.22125/agmj.2019.113607. نسب پور, سحر, حیدری علمدارلو, اسماعیل, خسروی, حسن, وصالی, علی. پهنه‌بندی آسیب‌پذیری از خشکسالی در ایران با استفاده از مدل AHP و منطق فازی. هواشناسی کشاورزی, 1397; 6(2): 3-12. doi: 10.22125/agmj.2019.113607. در مطالعه حاضر، به منظور ارزیابی آسیب‌پذیری به خشکسالی از روش تحلیل سلسله مراتبی متشکل از پنج شاخص اقلیم، توپوگرافی، تراکم آبراهه، کاربری اراضی و منابع آب زیرزمینی استفاده شد. پس از تعیین وزن هر یک از شاخص‌ها و زیر شاخص‌ها، با استفاده از توابع منطق فازی در نرم‌افزار ArcGIS، نقشه عضویت فازی هر یک از شاخص‌ها محاسبه و با استفاده از عملگر فازی امگا (9/0=γ) هم‌پوشانی آن‌ها ترسیم و طبقه‌بندی شد. بررسی نقشه آسیب‌پذیری خشکسالی ایران نشان داد نواحی مرکزی، شرق، جنوب، شمال شرق و جنوب شرق کشور به طور عمده در دو کلاس آسیب‌پذیری خیلی کم یا خیلی زیاد قرارگرفته‌اند. همچنین نواحی رشته‌کوه‌های زاگرس و البرز در کلاس زیاد قرار می‌گیرند. اکثر مناطق شمال غرب و غرب کشور همچنین سواحل شمالی در کلاس‌های آسیب‌پذیری متوسط تا خیلی کم قرار دارند. این عامل در ناحیه اطراف دریاچه ارومیه در محدوده زیاد تا متوسط متغیر بود. In this study, Analytic Hierarchy Process method was used to assess drought vulnerability in different regions of Iran, using five indices including climate, topography, drainage density, land use and groundwater resources. After determining the weight of each index and sub-index, the fuzzy membership maps were calculated using Fuzzy logic functions in ArcGIS software. Then, by use of omega fuzzy operator (γ=0.9) the maps over laps were drawn and classified. Drought vulnerability map of Iran showed that central, Eastern, Southern, North East and South East regions are mainly located in two vulnerability classes of very low and very high. Also, Zagros and Alborz mountains region classified as highly vulnerable. Most areas in north and northwest of the country as well as northern coastal region are located in medium to very low vulnerable classes. Lake Urmia region is mostly occupied by high and medium vulnerability classes. Bazza, M. O. 2002. Water Resources Planning and Management for Drought Mitigation. Regional Workshop on Capacity Building on Drought Mitigation in the Near East. Bella, S. Z., Nemath, A. D., Szalai, S. 2005. Application of gis tools: drougth vulnerability in Somogy County, Hungary. Geophysical Research Abstracts. 7(02530):1076-1083. Bonham-Carter, G. F. 1991. Geographic Information System for Geoscientists: Modeling with GIS. Computer Methods in the Geosciences, 398 Pages. Deressa, T. 2010. Assessing of vulnerability in Ethiopian agriculture to the climate change and adaption strategies. Ph. D thesis. Environmental economics, university of Pretoria. FAO. 2010. Global forest resources assessment, FRA 2010-Country report, Iran. [Online]. Available athttp:// www.fao.org/forestry/fra. Fathabadi, A., Gholami, H., Salajeghe, A., Azanivand, H., Khosravi, H. 2009. Drought forecasting using neural network and stochastic models. Advances in Natural and Applied Sciences, 3(2), 137-147. He, B., Wu, J., Lu, A., Cui, X., Zhou, L., Liu, M., Zhao, L. 2013. Quantitative assessment and spatial characteristic analysis of agricultural drought risk in China. Natural Hazards, 66(2): 155–166. Hewitt, K. 1997. Regions of risk: A geographical introduction to disasters. England: Addison Wesley Longman Harlow, 23 (4): 365–382. Hill, M. J., Braaten, R., Veitch, S. M., Lees, B. G., Sharma, S. 2005. Multi-criteria decision analysis in spatial decision support: the ASSESS analytic hierarchy process and the role of quantitative methods and spatially explicit analysis. Environmental Modeling and Software, 20(7) 955-976. Khoshnodifar, Z., Sookhtanlo, M., Gholami, H. 2012. Identification and measurement of indicators of drought vulnerability among wheat farmers in Mashhad County Iran. Annals of Biological Research, 3(9): 4593-4600. Lee, M., Pham, H., Zhang, X. 1999. A methodology for priority settingwith application to software development process. European Journal of Operational Research, 118(2):375–89. Leichenko, R. M., O-Brien., K. L. 2001. The Dynamics of Rural Vulnerability to Global Change: The Case of southern Africa. Mitigation and Adaptation Strategies for Global Change, 7 (1):1-18. Malczewski, J. 1999. GIS and Multi Criteria Decision Analysis. John Wiley and Sons INC., 408 pages. Marinoni, O. 2004. Implementation of the analytical hierarchy process with VBA in ArcGIS. Computers and Geosciences., 30(6):637-646. Me-Bar, Y., Valdez, J. 2005. On the vulnerability of the ancient Maya society to natural threats. Journal of Archaeological Science, 32(6): 813–825. Mishra, A. K., Desai, V. R. 2005. Drought forecasting using stochastic models. Stochastic Environmental Research and Risk Assessment., 19(5): 326-339. Moss, R., Brenkert A., Malone, E. 2001. Vulnerability to climate change: aMulti-criteria decision analysis. Global environmental change, 18 (1):112-127. Rossi, G., Benedini, M., Tsakiris, G., Giakoumakis, S. 1992. On regional drought estimation and analysis. Water Resources Management, 6(4): 249-277. Sadeghravesh, M., Khosravi, H., Ghasemian, S. 2015. Application of fuzzy analytical hierarchy process for assessment of combating-desertification alternatives in central Iran. Natural Hazards: Journal of the International Society for the Prevention and Mitigation of Natural Hazards, 75(1): 653-667. Santos, M. J. J., Verıssimo, R., Rodrigues, R. 2001. Hydrological drought computation and its comparison with meteorological drought. In: Demuth, S., Stahl, K. (Eds. ), ARIDE—Assessment of the Regional Impact of Droughts in Europe. Final Report to the European Union. ENV4- CT97-0553. Institute of Hydrology, Freiburg, Germany, pp. 78–79. Shahid, S., Behravan, H. 2008. Drought risk assessment in the western part of Bangladesh. Journal of Natural Hazard Review, 46(3): 391-413. Sivakumar, M., Wilhite, D. A. 2002. Drought preparedness and drought management. Drought Mitigation and Prevention of Land Desertification, Drought Mitigation and Prevention of Land Desertification (Proc. Intern. Conf., Bled, Slovenia), UNESCO/Slov. Nat. Com. ICID, Ljubljana, paper 2. Song, L. C., Deng, Z. Y., Dong, A. X. 2003. Drought. China Meteorological Press, Beijing. 162 pages. Statistical Yearbook of Road Maintenance and Road Transport. 2012. Planning, Office of the Information and Communication Technology. Available at http://www.rmto.ir. Sui, D. Z. 1992. A Fuzzy GIS Modeling Approach for Urban Land Evaluation. Journal of computers. Environment and Urban Systems, 16(2):101-115. Vincent, K. 2004. Creating an index of social vulnerability to climate change for Africa. Technical Report 56, Center Tyndall Climate Change Research, University of East Anglia, Norwich. Walter, J. 2004. World disasters report 2004: focus on community resilience. Kumarian, Bloomfield. Wilhite, D. A. 2000. Drought as a natural hazard: concepts and definitions, chapter 1. In: Wilhite DA (ed) Drought: a global assessment. Natural hazards and disasters series, Routledge Publishers, UK. Xiao-Chen, Y., Yu-Liang, Z., Ju-Liang, J., Yi-Ming, W. 2013. Risk analysis for drought hazard in China: a case study in Huaibei Plain. Natural Hazards, 67(2): 879–900. Zehtabian, G., Karimi, K., Mirdashtvan, M., Khosravi, H. 2013. Comparability Analyses of the SPI and RDI Meteorological Drought Indices in South Khorasan Province in Iran. International Journal of Advanced Biological and Biomedical Research, 1(9): 981-992.